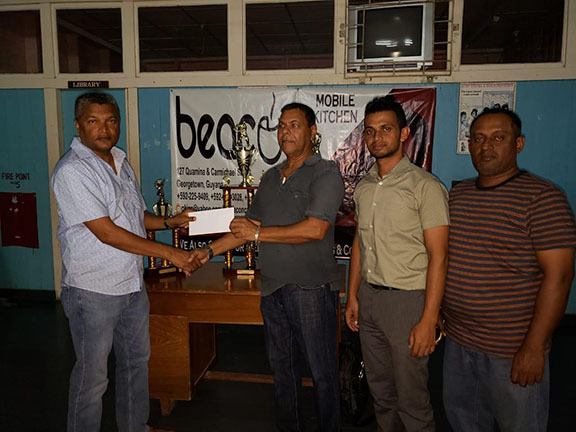 WDCA President Anand Sanasie (extreme left) receives the sponsorship cheque and trophies from Beacon Cafe representative in the presence of the WDCA competition Secretary and Chairman. The West Demerara Cricket Association in collaboration with title sponsors, Beacon Cafe has rolled out the inaugural 50-overs round robin tournament. The tournament, which got underway on Sunday last, saw New Windsor, Dynasty, Saw Pit and Windsor Forest recording victories across Region Three. At Joe Vieira Park, New Windsor defeated All Youths by six wickets. All Youths won the toss and elected to take first strike as Sewchan Narine and Krishan Ramjeawon shared in a 54-run opening stand in just 11 overs. However, when Narine was bowled by Roger Henry for 23, All Youths lost nine wickets for 36 runs as Henry and Desmond Ally returned 4-23 and 4-16 respectively. Nevertheless, a last wicket partnership of 35 between Zahir Azeez and David Ross ensured All Youths post 125 in 30.5 overs. In reply, New Windsor cruised to 126-4 in 17.3 overs as Chris Rajpot top scored with 37 and was supported by Vishal Kanhai who made 23. Azeez returned to take 3-20. At Bel Vue Ground, Players Cricket Club were defeated by Saw Pit by six wickets. Batting first, Players were skittled out for 78 in 27 overs with only Davinand Jailall (12) reaching double figures as Ravinandan Ramnarine took 5-31 and Imran Khan complimenting with 2-24. Saw Pit raced to 79-4 in 12 overs with Jewan Hamid blasting 30 while Shivdat Motee tried to defend the paltry total with 3-43. Meanwhile, Dynasty Cricket Club defeated Malvern by seven wickets at Wales Community Development Center. Malvern won the toss and opted to bat but regretted that decision as they were bowled out for 66 in 16.1 overs with Erick Sukhra (3-26) and Robin Singh (2-7) being the principal wicket takers. In the chase, Yogendra Singh’s unbeaten 24 was enough to steer his side to 67-3 in 12 overs. In the final contest, Windsor Forest defeated Christ Ambassadors at Zeeburg Ground. Eighteen teams will be vying for the Quamina and Carmichael Street-based eatery championship with the top two advancing to the semi finals.